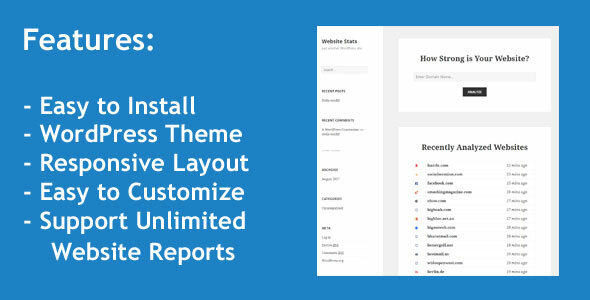 Web Stats WordPress Theme let you create your own dedicated website for Web Analysis and Worth Estimation services. It analyzes the website against key metrics like SEO, Traffic, Rank, Social Engagement, and Performance. It can generate and save unlimited website reports. It is designed using a mobile-first approach, meaning your content takes center-stage, regardless of whether your visitors arrive by smartphone, tablet, laptop, or desktop computer.